Continue to plant roses. Avoid planting roses in areas where roses were previously growing otherwise new introductions may suffer from replant diseases. Check tree ties and stakes. Replace, tighten or slacken them where necessary. Firm back newly planted trees and shrubs if they have been lifted by frost heave or by strong winds. Remove weeds from around the bases of young trees. Check protective coverings on newly planted or borderline hardy trees, shrubs and climbers, to ensure they remain secure until the risk of frost has passed. Mulch and feed shrubs, trees, hedges and climbers after pruning, to give them energy for the extra growth they will put on after cutting back. Tie wall shrubs and climbers onto their supports to protect them from wind damage. Trim winter-flowering heathers as the flowers fade. Shears are the ideal tool. This will prevent the plants from becoming leggy and bare. Deciduous flowering Prunus species (ornamental cherries, plums and almonds) are vulnerable to silver leaf if pruned before mid-summer, and anyway should not require routine pruning if planted with sufficient space for their eventual size. When pruning, concentrate on removing overcrowded growth, crossing stems, and dead, damaged, or dying branches. Aim for an open centre, through which air can circulate, as this will reduce the risk of pests and diseases. If your trees are too large for you to manage pruning alone, you may need a tree surgeon. Otherwise take care not to damage the tree when sawing off thicker branches. Delay pruning spring-flowering shrubs until immediately after flowering, otherwise this year's display will be lost. Do not prune slightly tender evergreen shrubs (such as Choisya, best left until April), but do tackle hardier examples (such as Prunus laurocerasus, the cherry laurel), if necessary. Shrubs such as Buddleja davidii, Salix alba var. vitellina cultivars and Cornus sanguinea cultivars are usually stooled (i.e. cut back very hard), because this keeps them at a manageable size, as well as deepening the stem colour of those grown for their winter stems. Cut out the top rosette of leaves from the leggy stems of Mahonia x media cultivars to encourage branching. Cut or renovate deciduous hedges if necessary. They can still be renovated before leaf emergence. Spur-prune all current stems on Campsis by cutting back the laterals to within two or three buds of the main branches forming the framework. Cut back climbers such as ornamental vines, ivy, Virginia creeper and Boston ivy – it’s a good idea to keep them away from windows, doors, gutters and roof tiles. Prune wisteria by cutting back the sideshoots shortened by summer pruning to two or three buds (2.5-5cm/1-2in). Avoid cutting off flower buds. Cut back late Clematis in the summer and autumn flowering (Group 3) to the lowest pair of strong buds. Mulch and feed at the same time. Prune winter-flowering jasmine (Jasminum nudiflorum) once the flowers have faded. Remove any dead or damaged shoots, tie in new shoots to the main framework, and then shorten all the laterals coming off the main framework to 5cm (2in), cutting to a bud. This will keep the plant neat, and improve flowering next winter. 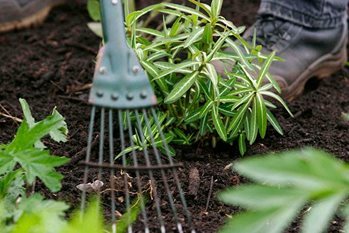 It is a good idea to feed and mulch after pruning, as the plant will put on lots of growth in response to cutting back. Summer-flowering jasmines may also be pruned (if necessary), providing that they are reasonably hardy in their situation. With these you should remove a couple of stems completely to ground level, and avoid cutting back laterals, as this would damage the current year’s flowering potential. Sow tree seeds that have been kept in cold storage since collection in the autumn. The famous Bramley apple was grown from a seedling (see right). This is the last month you can still take hardwood cuttings of ornamental shrubs such as Cornus, Salix, Forsythia, Weigela, Escallonia, Rosa, Ribes, Chaenomeles and Elaeagnus. Many deciduous climbers can also be propagated in this way (e.g. Fallopia and Lonicera). Check hardwood cuttings taken last year - they may need planting or potting on. Inspect sick looking box and holly trees for signs of box blight and holly leaf blight. Bracket fungi on trees is more visible at this time of year. If the tree is in poor health it is worth calling in a tree surgeon for a professional opinion. Check for damage or cankers on deciduous trees.